The controversy over the Imedi TV hoax news programme has been stoked further by Georgian internet site Forum.ge releasing a taped phone conversation allegedly between head of Imedi TV Giorgi Arveladze and his deputy Eka Tsamalashvili late on Monday. On the tape a woman, allegedly Eka Tsamalashvili, warns that airing the fake report as if it were a genuine news item would be considered a violation of the Law on Broadcasting. She proposes that a notification be put on the screen informing viewers that the report is not genuine. However a man, allegedly Giorgi Arveladze, tells her that the day before he had spoken to “Misha” – a nickname for President Mikheil Saakashvili. “He [Misha] asked me if the programme would be aired as a regular Kronika [news programme on Imedi TV]. I answered yes, but said that at the beginning it will be indicated that it is a simulation. He said not to say so, because the whole effect would then be lost,” the man continues. Arveladze has denied having such a conversation with his deputy, calling the tape a “fabrication.” “This is a provocation backed by the Russian special agencies, as the material was published on a website linked with the Russian special services,” Arveladze said. “The taped conversation is completely fabricated. These phrases have been picked up from different conversations of mine. They can make up a conversation between me and the Dalai Lama or the Pope in this way,” he noted, adding that he has difficulty recognising his voice in the taped conversation. Deputy head of Imedi TV Eka Tsamalashvili called the audio material “absurd and a lie”, and denied that she had received any recommendations from Government officials while working for Imedi. “I agreed to work here after having been given firm guarantees of this,” she said. Tsamalashvili also suggested that the conversation had been made up by Russian special agencies. Some opposition politicians have cast doubt that the taped conversation was fabricated. The Christian-Democratic Movement (CDM), the leading Parliamentary minority group, demanded that a special investigative commission be set up to find out whether the material is authentic or not. Speaking at a special media briefing on Tuesday CDM leader Giorgi Targamadze said, “If the Parliamentary majority is confident that they are right, they should support creating an investigative commission and prove that the material is falsified,” Targamadze stated. Leader of the Alliance for Georgia and former Ambassador to the UN Irakli Alasania suggested that the President had planned a “psychological attack” on the Georgian population. “It is very clear. President Saakashvili planned and carried out a psychological attack on the population through the media,” Alasania said on Tuesday. He called for finding out whether the taped conversation was authentic or not with the help of foreign experts. “If the authorities and the Imedi TV head agree to this we will believe that the conversation did not take place in the form in which it was released,” Alasania said. 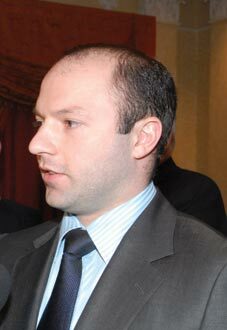 The content and style of speech recorded on the tape are “very close” to authentic, independent analyst Irakli Sesiashvili suggested. “I know both Eka Tsamalashvili and Giorgi Arveladze, and I know their manner of speaking. The taped speech absolutely coincides with their manner,” the analyst told The Messenger, adding that it is impossible to maintain natural intonation and idiolect in a fabricated tape. Sesiashvili said that due to the low public confidence in the authorities an independent investigation should be carried out by the foreign experts into whether the material is falsified or not. President Saakashvili once more distanced himself from the hoax news programme on March 15. His press speaker Manana Manjgaladze called the claims of the opposition that the simulated report was agreed with Mikheil Saakashvili in advance and aimed to discredit the opposition “absurd”. “If we judge logically, on the basis of the panic and reaction which followed the report, it is clear that the authority of the administration was damaged most of all,” Manjgaladze told journalists. Meanwhile the EU Monitoring Mission released a special statement on March 16 concerning the hoax TV programme, saying “this type of irresponsible programming has the potential to seriously destabilise the situation close to the boundary lines.” “Dangerous and significant incidents could have occurred,” the statement reads. The EUMM notes that the security situation at the administrative border lines with South Ossetia and Abkhazia has improved “considerably” since winter 2008 and has remained calm in the aftermath of the TV broadcast. “However our monitors witnessed the anxiety and concern of the local population for their security and safety caused by this incident,” the statement reads. “We call on all those in positions of responsibility to fully consider the implications of their actions in future. It must be in everyone’s interest to ensure that security and stability are maintained,” it continues.